The country kitchen is sweltering, and long wooden spoons are constantly swirling inside stainless steel pots. Sleeves are bunched around elbows, and apron strings are tightly knotted. We turn our heads to catch a breeze that softly billows out the gingham curtains. This is canning season with the women of my family. When I think about Southern food, alongside visions of grits and fried green tomatoes (OK – fried anything! ), this memory of canning is foremost in my mind and on my tongue. I long for my mother’s dilly beans and my grandmother’s stewed tomatoes with okra. Canning is the best way to have farm to table food all year round, and the most effective way to know with certainty what you are eating. But canning your own food often strikes intimidation into the most confident cook. It can be labor intensive, and then there are fears about sanitation. It’s one thing I have yet to try on my own even though I’ve enjoyed homemade canned goods all my life. Consequently, I was excited to virtually meet Jenny over at The Domestic Wildflower who has made it her mission to slay canning’s intimidating persona (along with other “old fashioned” domestic pursuits). She provides step-by-step recipes for tasty canned goods and even has a canning e-course for beginners. 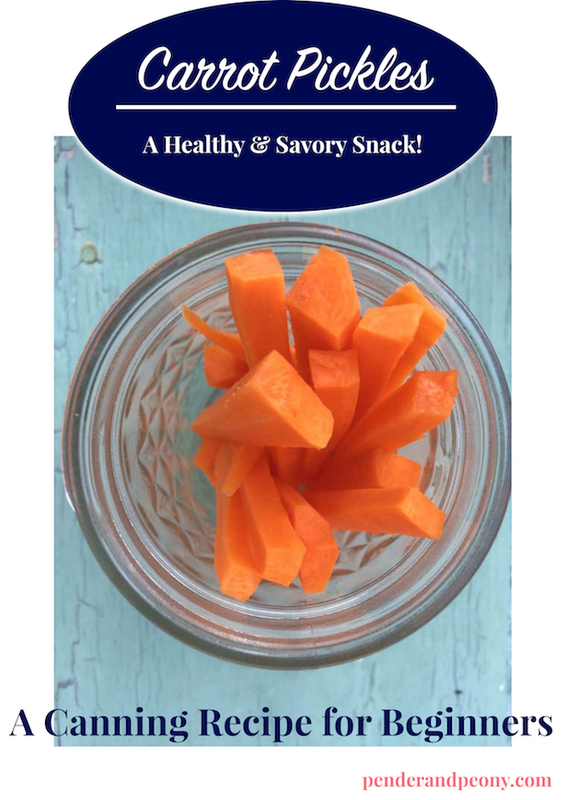 Today, I invited Jenny on P&P to share her recipe for canning carrot pickles! 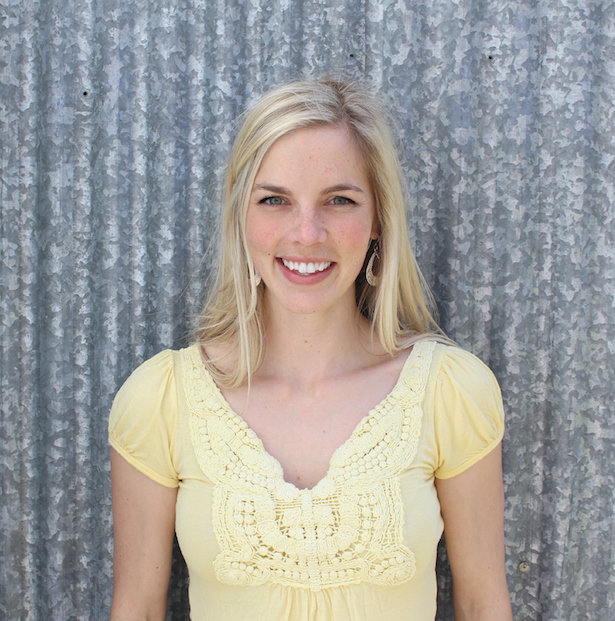 Hi, I’m Jenny and I blog at The Domestic Wildflower. I’m a big fan of helping people make more handmade and homemade for the home and plate, especially with canning. To me, canning is THE way to give yourself choice at suppertime when you are rushed. Canning is when you preserve fruit and veggies for later in a glass canning jar that has been submerged for a specific number of minutes in boiling water. The boiling water forces the oxygen (which would feed spoilers) from the jar, which creates an airtight seal. Canned food can be shelf stable for up to a year or more. It is a great way to have healthful, less/unprocessed foods ready year round. I live where the veggies available in the markets in December look pretty tired. I try to always have a large stock of canned items in the pantry so I’m feeding my kids a vegetable, rather than a mystery meal. I wanted to share with you a recipe that is simple for beginners and as easy at home on an hors d’oeuvre tray as in a lunchbox. You can mix it up with the seasoning options depending on your kitchen’s clientele, and feel confident that you’ll “do it right.” Pickles are great for beginners because of all the vinegar. 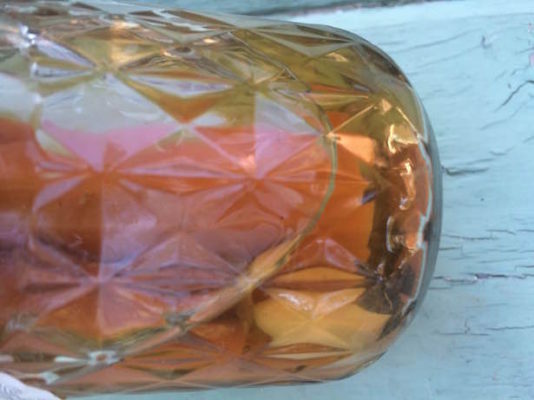 Vinegar is very acidic, which makes it impossible for spoilers to grow. Coupled with a boiling water swim, those jars are spoiler-free by the time you are done with them! These are easy to keep crisp and are a healthy, savory snack! Optional seasoning:1/2 teaspoon black pepper, 1 bay leaf per jar, 1 sprig thyme or dill per jar, shake of red pepper flakes to taste, about 1/2 teaspoon per jar- choose any or all of the above to suit your taste! Get the canning equipment list HERE! 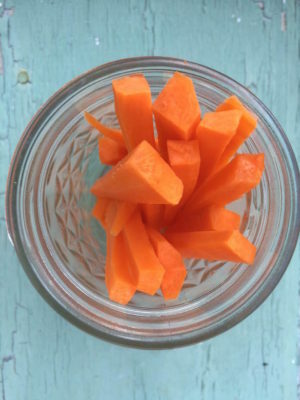 Cut carrots into sticks that are about 1/2 inch thick and no more than 4 inches tall if you are using pint jars. Let rest in ice water while you prepare your pots. Heat the processing pot full of 4-5 pint jars and water to a boil. Bring saucepan of lids and rings to a simmer. In the preserving pan combine the vinegar, 1 cup of water, salt, sugar, and any seasonings. Bring to a simmer and then add the carrots until they are just tender, about 9 minutes. Use the jar lifter to carefully remove a hot jar from the boiling water bath. Pour the hot water back into the pot, into the saucepan, or into the sink. Using the funnel, pack the hot carrots into the jars (not tight, just full), and then ladle the hot brine carefully over the carrots, giving it a chance to seep to the bottom. You may have to distribute pieces of onion and garlic and seasonings jar by jar using a clean, long handled spoon. After one jar is filled with carrots and covered with brine, put the lid and ring on and return it to the boiling water bath carefully. When all the jars are filled with carrots and brine, bring the pot back up to boil and process for 15 minutes, and add 5 minutes for every 1000 feet you live above sea level. When the time is up, remove the jars carefully to rest and seal on the towel covered countertop. Label cool jars and store. Thanks so much for letting me share with you all here on Pender & Peony! Partying at Inspire Me Tuesday.